West Florida Yachts would love to guide you through a personal showing of this 46' Jarvis Newman - Lyman Morse Trawler 1988. 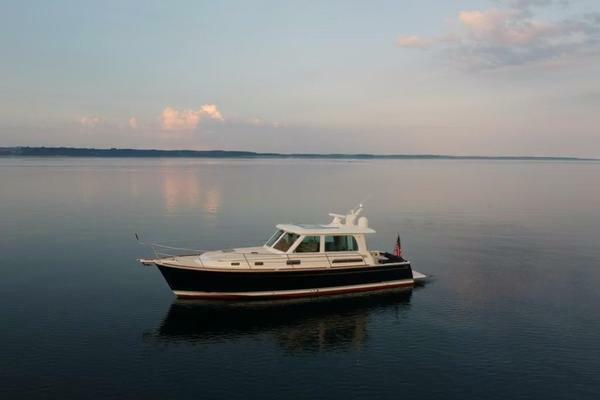 This yacht for sale is located in Harpswell, Maine and priced at $475,000. For a showing please contact us by filling out the form on this page and we will get back to you shortly! A wonderfully bright and airly interior finished "Herreshoff Style" below decks with varnished Mahogany trim on white flat panels while the Salon is finished in a warm varnished Butternut. The Salon was reworked as part of the 06/07 refit and the settee is new and helm station joinerwork is new. Tons of natural light and ventilation with ten opening ports, three large hatches and several large wheehouse windows, many of them sliders with screens as well as the aft companionway and P&S side doors. Generous artificial light with reading lamps at all settees and berths and numerous dome style lamps and decor lamps. When the weather is too warm or cold, her reverse cycle (heat & cool) units keep the interior at a comfortable temperature. Aft to port is a unique cabin "dual purpose" can easily accommodate another single sleeping berth for children, guest or a captain, again with plenty of storage in hanging locker and other lockers. This can easily be converted to an office should one so choose. The berth is desk height top and there is a built in knee well so that one can comfortably sit there. Across from the head and office cabin is a large elongated U- shaped Galley featuring expansive Corian counters with double basin stainless steel sink with superb storage in numerous lockers and drawers. Equally abundant storage for chilled food stuffs with two front loading refrigeration boxes and a top loading freezer while cooking is handled on a Force 10 3 burner CNG stove with oven while re-heats are handled in a GE Microwave. The helm station were fully refitted in in 2016 and the yacht is well equipped for coastal and near offshore cruising. New 2008 Yanmar fresh water cooled 655 HP diesel turns a 5 bladed propeller on a 2.5" stainless shaft through a ZF 2:1 reduction gear. (Shows 1105 hours as of 9/7/17) with 1000 hour servicing done 2016. Full bridge enclosure with great visibility '016. The Jarvis Newman 46, from the boards of Naval Architects Royal Lowell and Elliot Spaulding is a timeless design. The very efficient use of space in this particular yacht, which was finished out by Lyman Morse, provides for not only three comfortable staterooms but also a tremendous amount of storage making her an exceptional cruising yacht. ACADIA enjoyed an extensive refit of over $200,000 including new engine, genset, extensive re-wiring, extensive interior refinishing and other work in 2008. Under current ownership extensive further refit work was done in 2008 well in excess of $235,000 including Awlgrip from the boot stripe to flying bridge, all new electronics, all new ports, hatches and windows; all new pumps and air conditioning equipment along with many other items. A few relatively minor cosmetic items can be done but all of the high expense refit work is completed. This should be a very economical yacht to own for many years. A comfortable vessel, she will be a compelling value to those looking for a handsome unique single screw trawler.